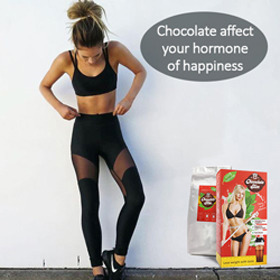 Have you ever thought that you would be able to lose weight with the taste of chocolate in your mouth on a daily basis? If not, then you probably didn’t hear about Chocolate Slim as one of the tastes supplement on the market. Thanks to its Natural Cocoa taste you will enjoy it. It produces the happiness hormone, which automatically eliminates the crave for sweets and increase fat burning process. This way you won’t have a feeling that you are not eating sweets. It is not just enough to lose weight, you also need to build your muscles, and the whey protein is just what you need. Thanks to this protein your body will be provided with 70% of provided calories during the digestion of the protein. When it comes to losing weight, it is more than important to prevent the depositing of fat. Soy Lecithin is the one that prevents it. To improve your mental state, you can count on vitamins and minerals that you will intake with this product. Once you try Eco Slim you will never stop using it; it will become a lifestyle for you, a chocolate lifestyle. I took a trip to Commercial Drive in Vancouver for lunch with a friend at Bandidas Taqueria. Bandidas dishes up vegetarian and vegan Mexican food in a casual, diner like atmosphere. I ordered an Hibiscus Cocktail and the Ronny Russell Tacos. The handmade corn tortillas came loaded with yams, onions, guacamole, black beans, purple cabbage, green salsa and pumpkin seeds. The unusual mix of ingredients tasted delightfully delicious together. I sampled my friends meal, the Vegan Hicks, as well. The tofu scramble was the yummiest Ive ever tried. This is a down-to-earth and inexpensive place offering brunch, lunch and dinner daily. I will definitely be stopping by again next time Im on Commercial Drive. YUM!!! Cant wait to check this place out! Wish I lived in a place where I could taste food like this!